Episode 67 - Jeffrey Foucault Dan Sterenchuk and Tommy Estlund are honored to have as our guest, Jeffrey Foucault. Jeffrey launched his new album, BLOOD BROTHERS, the much anticipated follow-up to his critically acclaimed 2015 album Salt As Wolves (“Immaculately tailored… Close to perfection” – The New York Times; “Pure Songwriter, simple and powerful” – Morning Edition, NPR) is a collection of reveries, interlacing memory with the present tense to examine the indelible connections of love across time and distance. The poet Wallace Stevens wrote that technique is the proof of seriousness, and from the first suspended chord of “Dishes” – a waltzing hymn to the quotidian details of life, which are life itself (‘Do the dishes / With the windows open’) – Foucault deftly cuts the template for the album as a whole, showing a mastery of technique as he unwinds a deeply patient collection of songs at the borderlands of memory and desire. In two decades on the road Jeffrey Foucault has become one of the most distinctive voices in American music, refining a sound instantly recognizable for its simplicity and emotional power, a decidedly Midwestern amalgam of blues, country, rock ’n’ roll, and folk. He’s built a brick-and-mortar international touring career on multiple studio albums, countless miles, and general critical acclaim, being lauded for “Stark, literate songs that are as wide open as the landscape of his native Midwest” (The New Yorker), and described as “Quietly brilliant” (The Irish Times), while catching the car of everyone from Van Dyke Parks to Greil Marcus, to Den Henley, who regularly covers Foucault in his live set. BLOOD BROTHERS is the sixth collection of original songs in a career remarkable for an unrelenting dedication to craft, and independence from trend. Jeffrey Foucault was 17 when he learned to play all the songs on John Prine’s eponymous debut of his father’s mail-order guitar, spending long evenings in his bedroom spinning piles of old records on a hand-me-down turntable, lifting the needle to transcribe every line of ‘Desolation Row’. At 19 he stole a copy of Townes Van Zandt: Live and Obscure from a friend, and a few years later, having quit school to work as a farm-hand and carpenter Foucault began writing the songs that became his first album (2001’s Miles From the Lighting). Since then he’s been everything from solo country-blues troubadour to front man for a six-piece rock ‘n’ roll band, along the way compiling a discography notable for its visceral power and complex poetics. Yet it wasn’t until he paired with drummer Billy Conway (Morphine) that the final piece fell into place and Foucault found the Luther Perkins to his Johnny Cash, the truly sympathetic collaborator to frame and fire his terse brand of Americana. 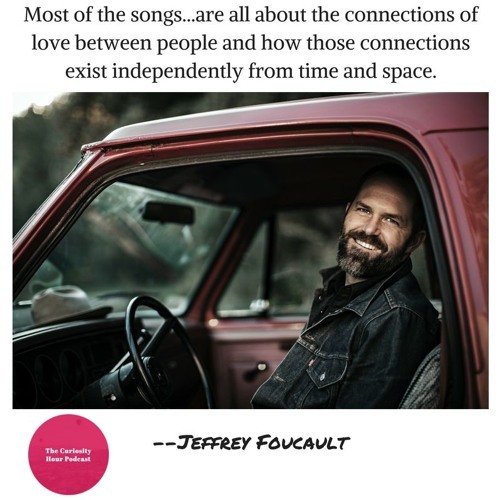 See more about his bio, discography, and information about where to buy his music at his website: https://jeffreyfoucault.com/discography/ Note: guests create their own bio description for each episode. The Curiosity Hour Podcast is hosted and produced by Dan Sterenchuk and Tommy Estlund. Please visit our website for more information: thecuriosityhourpodcast.com Please visit this page for information where you can listen to our podcast: thecuriosityhourpodcast.com/listen/ If you would like to share your story or have a suggested guest, please complete the "Contact us" form: thecuriosityhourpodcast.com/contact-us/ Disclaimers: The Curiosity Hour Podcast may contain content not suitable for all audiences. Listener discretion advised. The views and opinions expressed by the guests on this podcast are solely those of the guest(s). These views and opinions do not necessarily represent those of The Curiosity Hour Podcast. This podcast may contain explicit language.